Gosh, I love my husband. I love him for many reasons, not least of which is his taking me to no fewer than seven gardens this weekend. Seven. It’s definitely love. We’d booked flights to Melbourne to visit Paul’s mum and I’d managed to get three gardens signed off at the planning stage, which I thought, in itself, was pretty good going. But further opportunities came up and Paul continued to agree to drive me to another and then another. Paul’s very obliging mum smiled and agreed, too. I’m hence bursting with things to show and tell you, exploding with joy and ideas and enthusiasm and more. I’ll first give you a flavour of the six really fabulous gardens, from which I’ll pick a few to look at in more detail another time. The first garden we visited had a magical, magical entrance. A 500 metre driveway lined with stately Dutch elms, twinkling in the late morning light. Sadly, we were too late for the bluebells, which underpin these majestic, yet delicate, trees but we did see plenty of colour further on, with vast expanses of lupins, numerous types of playful Aquilegia and one of my very favourites, peonies, in a whole host of shapes and sizes. The 1897 conservatory in Bendigo’s Rosalind Park…full of hydrangeas! We then ventured north to Bendigo, visiting a very sadly drought-effected garden along the way, before heading to Rosalind Park. It was a beautiful day and there was so much life in the park, people of all shapes and sizes out enjoying the fresh air and the trees and the ornamental displays. As we approached the architectural conservatory, I was somewhat excited to see ‘my’ gorgeous hydrangeas filling the room from wall to wall, all thriving in outstanding health. It was there that I got a call from Michael McCoy, who knew we were in the area and kindly had a couple of suggestions for gardens we might like to see…and that’s where my very best eyelash fluttering commenced! Michael was absolutely right. This garden is incredible. From the moment we walked in, even my poor, hard working chauffeur perked up when he saw the garden unveil in front of us. Sweeping lawns and vast and plentiful established trees, underplanted with large swathes of stunning shrubs and perennials was enough to brighten anyone’s day. 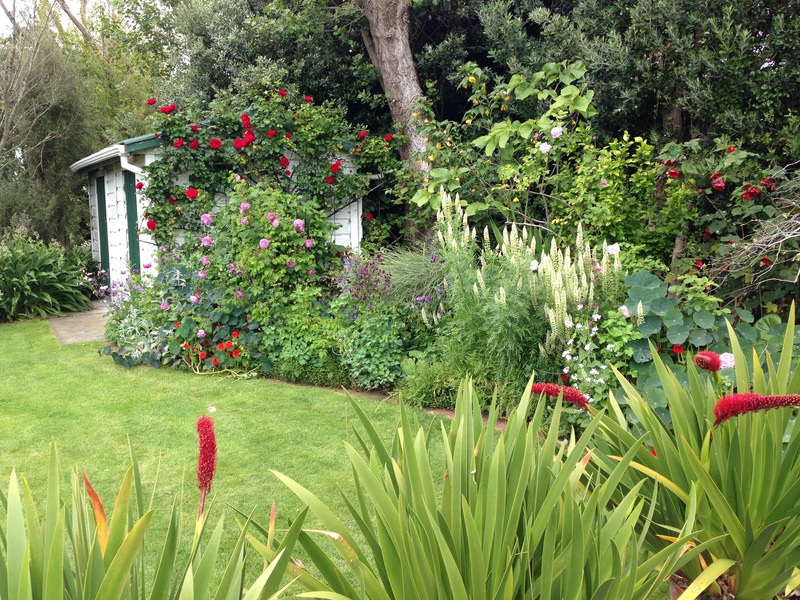 We were lucky enough to chat to the owners, Judith and John, to learn more about the garden; in fact I probably shouldn’t say anymore…this is one to share in much more detail on a separate post. If I’m honest, this garden is all a bit of a blur. Having followed Michael through forests and farmland; hairpin bends, numerous junctions and lots of dusty roads, I don’t even have any real idea where it is. On arrival, I was so completely gobsmacked by its breathtaking beauty, I was all a bit lost for words. I don’t even have any photos that do it any kind of justice, which I’m usually pretty focussed on. I just soaked up the incredible planting combinations in front of me, soaked up Michael’s endless enthusiasm and encouragement and then pretty much collapsed in a heap, saying ‘no more (at least until tomorrow)’, feeling that my brain was about to explode with mind-blowing gardens. I had the Lord Howe Island feeling of it all just being too much and needing to sit down! Steven Wells’ incredible home garden. I adore the window on the right (along with everything else)! Of course, the next morning, I was ready to go again. And what an amazing treat we had in store. I had seen many photos of Steven’s garden, even video footage from it airing on Gardening Australia and I was clear from numerous conversations with Steven, that any garden of his was going to be good. But nothing had prepared me for what I saw on arrival. It was the ultimate example of someone taking potential problems and converting them into opportunities. Never again, do I want a garden without impossible slopes, and the idea of having 90 degree corners to a plot is unthinkable in future. Various acute angles, none quite lining up with anything else, is exactly that you need. For this garden doesn’t just deal with difficulties, it positively grabs hold of them, takes charge and results in a garden with such depth, complexity and variety, whilst retaining a feeling of total cohesion. Wow. Clearly another one for a further post. After an absolutely delicious lunch in the magical setting of Steven’s garden, Steven, Paul and I headed off to Alowyn gardens, in the Yarra Valley. 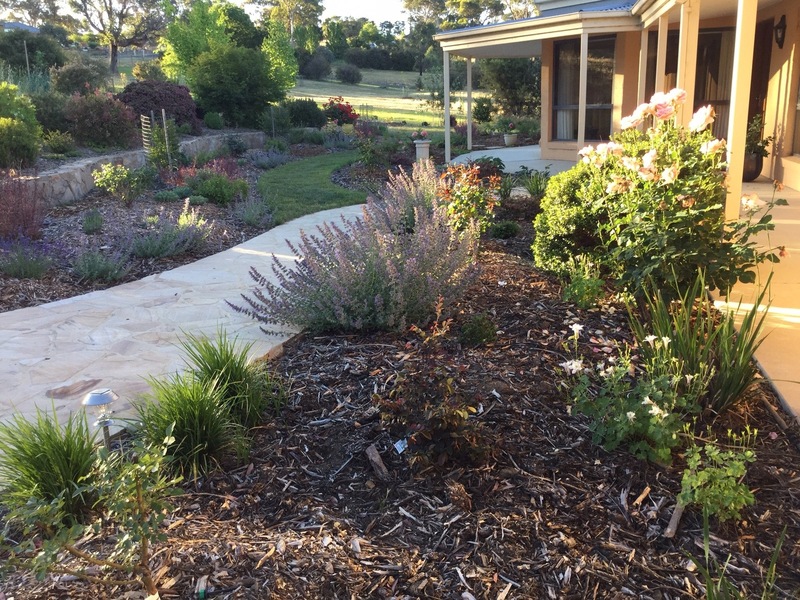 This four acre garden was simply blackberry-infested paddock just 18 years ago and it’s aim to educate, inform and be a place of beauty has certainly transpired. Its sight lines were quite something, you’d turn your head and see a totally unexpected view of the central fountain, or a gateway through to another garden. There was lots of experimentation, some areas working better than others, but any experimentation is good by me. We only progress by trying new things so it’s wonderful that the owners have gone out on a limb and generously shared their ideas. I’ve got many more beautiful photos to come. It was really quite an immersion into outer Melbourne and rural Victorian gardens; a lovely contrast to the urban gardens I see more often. The dryness of the countryside really hit me hard; so many areas of baked, solid, dusty earth, with no vegetation or even organic particles in sight. Sydney really is very green by comparison, however often I feel I am out there watering. I loved the Australianness of the straw coloured fields and the green grey gums which dominated the areas we saw. And I loved the ephemeral feel of all the delicate perennials, bursting with life and colour and possibility. By comparison, Sydney gardens feel very solid, heavy, static and clumsy. But you always wish for what you can’t have and I know from experience that I’m very fickle when it comes to gardens. The last one I saw is usually my favourite. And so another weekend is over, back to work today. My Victorian extravaganza will stay fondly in my mind, images of those stunning gardens etched onto my brain. And I’ll continue to bring Paul cups of tea in bed and respond to his every wish, until I feel I have gone some way to repaying his kindness. The ‘five gardens husband’ (in one day), or, encouragingly led on by Steven, the ‘seven gardens husband’ (over the weekend) payback may run out fairly quickly, but as I said to Michael, when discussing whether one more garden may end my marriage, Paul is definitely a ‘keeper’. Bless him and all the lovely gardeners that shared their special spaces with me this weekend. Lovely Janna, Hope I get to visit some of these at some stage. Thanks for your comment, Fiona. I hope you get to see some of them, too. So many lovely ‘Englishy’ flower beds; you would just adore them! Well you have given me faith Janna – after viewing a few mediocre gardens and one great one (but one that the owners have obvious trouble maintaining), here in Victoria’s east during October, I almost lost faith in Victoria as having any garden worthy of viewing. Now I can’t wait for next year and Ian’s retirement, so he can too be the garden chaffeur (hope he is as kind as Paul!). Go west young man!!!! I think we both have high aspirations, Adriana, and so not all gardens will provide us with what we are looking/hoping for. I probably only write up a third of the gardens I see. But asking around for recommendations seems to be the way forward. I AM going to get that full list of gardens produced over the next few months, so that will start you off nicely next year. You’re going to have a fantastic time! Ahhh, yes, Janna, I go and visit Victorian gardens twice a year, while I go to see my Melbourne based children. By the way they say that I just happen to see the on my way to see the gardens :). I have seen some of those you mention and I have met Micheal on one of the Garden Design Fest bus tours 2012. I was most impressed with his work on Lin Fox’s garden in Mt Macedon, Hascombe, really just stunning.Very worth seeing when it happens to be open. It is amazing how different our gardens are in different parts of the country, isn’t it? I guess I shouldn’t really say amazing, as we are such a very large and diverse country, by all measures. But it’s great that we can explore and see such variety, as long as we keep our envy in check! Can I guess that you don’t make so many visits to see your children in the winter months?! Cups of tea in bed? Steady Janna, a dangerous precedent! The gardens look wonderful and can’t wait to see more. I’ve gone way too far, haven’t I, Jessica? Wow Janna! Seven sounds like you were busy…….he is very patient. Hope he got some joy out of the experience as well. I look forward to reading further blogs about them. I like that you take us to places I have never heard of. I am particularly interested in Tieve tiara and Micheal McCoy gardens. Seven was a lot but Paul did enjoy them. Thank goodness for Tieve Tara perking him up half way through! I’ll try and share more soon; just got a silly long to do list at the moment. When is my quiet summer downtime coming? !